This is Mon, one of the numerous Tuk Tuk drivers in Siem Reap. Mon lives alone in Siem Reap, his family lives about 80km in the south of Pnomh Penh, so the whole distance is about 400km. In the past, it was different. 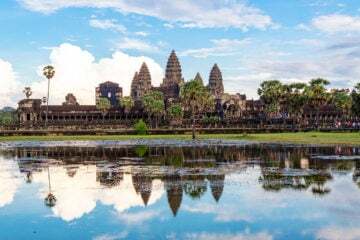 In this time, he lived together in Siem Reap with his wife and his two children – Mon has got a three years old daughter and a son at the age of 8 months. But in the long run this was too expensive. So his wife went back again to their homeland together with both children. Because life there is much cheaper. Every three months, Mon visits his family and brings some money, which he has saved. His big dream is to built up a nice house for his family on their homeland. Want to see such wonderful areas?